Today was supposed to be easy. The morning started promising with an early rise, a personal ride to the airport and my ideal airport arrival time of one hour before boarding. I felt more anxious than excited, tearing up during the goodbye and wishing more than ever to be going on this trip with my husband. At the airport I noticed my flight’s departure changed from 7 a.m. to 8 a.m., which still put me in a good position to catch my connecting flight at LAX. I settled in near my gate and waited to board. I was paged to the gate desk. What? Me? I’d always wondered what happened to the people who belonged to the names I heard at the airport. And now the name belonged to me. What excitement awaited? 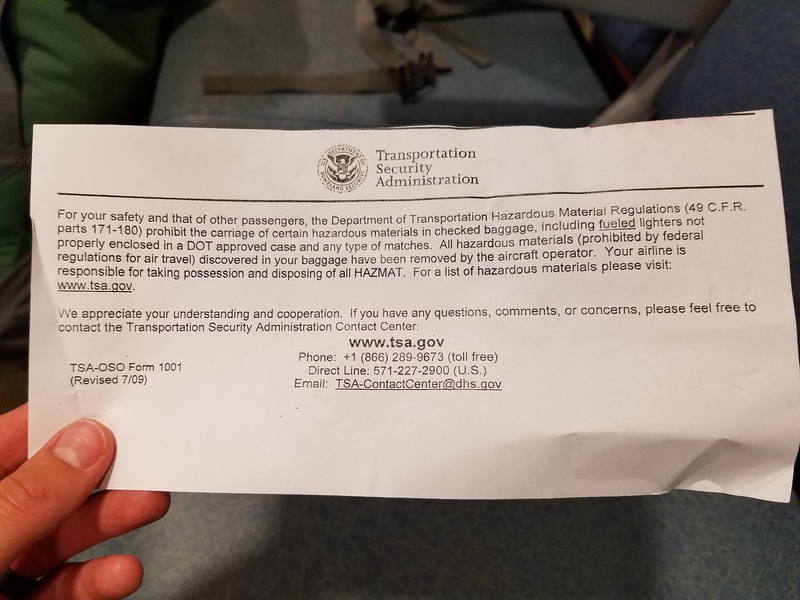 I had isobutane in my checked bag. Confused and thinking about a tiny aerosol I had packed in my toiletries, I asked if this was the problem. “No, isobutane. Camping fuel. You definitely can’t bring that on a plane. It could cause a huge explosion.” Oooooooh. Duh. How did I look up traveling with aerosals and bear spray but not think about stove fuel? Dumb. It was removed, my bag was still traveling, I was told everything else should be intact. Fine. I could just buy fuel in Yosemite. But my fuel had been near the bottom of my bag, which caused my mind to begin racing with what-ifs of other items that could have been removed or not repacked. I was going to miss the last bus to Yosemite. We touched down at LAX just before 10 a.m., raising my hopes that I could somehow still catch my 10:20 flight to Fresno. But we taxied for over 20 minutes, and as luck would have it my connecting flight departed ten minutes early. I was re-routed to a 2:30 flight. I called my husband, mainly to update him, and he immediately started looking into alternative flights and transportation to Yosemite. I did the same, focusing on how I’d get to the trailhead. Finding buses and trains to Yosemite that had final departure times just after the time we were set to land, I asked the flight attendant at my gate if there were any earlier flights. She said I just missed one that left at 10:20. Yeah. That was my flight. I asked if there were earlier flights through other airlines and she said I’d have to look into that myself. Apparently airlines aren’t responsible for missed connections due to delays. Crawling internet speed and an outdated, dimly-lit terminal made the situation seem hopeless. Everything had to be booked online. As a phone-aversed person, this should have been great. But with a huge lack of internet speed I was frustrated and instantly aged 30 years. Don’t these places list phone numbers? How do I talk to a real person? Millennials ruin everything! This led to cry #1. I wasn’t even on the trail yet. How would I handle changing plans on the trail if I couldn’t do so in an airport? I was lonely already. Why did I do this? At least with a travel buddy these things can turn into jokes. Alone it’s just depressing. Spirits were at an all-time low. I decided that once I got to Fresno I’d spend the night and take the 3:40 a.m. bus to Yosemite, which would get me there just before 8 a.m. My original plan was to pick up my permit the day before and get an early start hiking. Now I’d have to wait for the permit office and general store to open the morning of my start date before I could take off, so 8 a.m. was ideal. I listened to Brandi Carlile on the short flight from LA to Fresno, which somehow made me tear up and feel better at the same time. My mood improved at the Fresno airport, with murals of Yosemite and giant faux sequoia trees surrounding me. Seeing my bag on the carousel brought instant relief, as did the fact that only the camp fuel was missing from my pack. I asked a security guard where the YARTS bus to Yosemite picked up, explaining that I was taking the early bus the following day. He pointed out the pick-up location and a great spot in the airport where I could hang out and have some privacy, assuming I was spending the night. He raved about the small airport’s security, saying that it’s very common for backpackers to sleep there. I hung around the airport for a while before deciding that the hard floors and florescent lights would make for a difficult night of sleeping. In the end I shelled out $109 for a night at the Wyndham, a hotel across the street from the airport. I could use a bonus shower and a restful night’s sleep before starting the hike. The day was a reality check. I wondered if I was mentally ready for the trail. Cali gave me a good hazing and reminded me that nothing is certain. I will feel lonely. And spirits will rise and fall with each new challenge. But the lows will make the highs feel even better. And a positive mindset is all about perspective, right? I’d gladly take the time to reorganize my pack and watch some Gilmore Girls at the hotel. But I was determined to make that bus. There was a JMT permit with my name on it, and I was officially excited to start the trail. Two weeks. Two-hundred twelve miles. How do you pack for such a trip? Packing for a backpacking trip, whether it’s the John Muir Trail, a different thru-hike or a weekend getaway, can be a difficult task. What you bring can’t be left in a hotel room or the spare bedroom of a friend; it’s with you for the long-haul. Overpacking means carrying extra weight, and underpacking means forgetting potentially vital items. My John Muir Trail packing list sticks with the basics. While a few of my items might be considered luxuries, for the most part I’m sticking with only what I absolutely need to avoid hauling extra weight over the trail’s seven mountain passes.